Kelly Wearstler is an interior designer whose work includes the trendsetting Viceroy resorts from California to the Caribbean, taste-making hotels like Maison 140 and Avalon, the BG restaurant and lounge at Bergdorf Goodman, and upscale residences such as the Trousdale Estate. 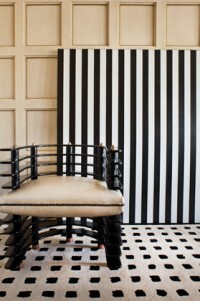 Her luxurious interiors are renowned for their use of rich colors, bold textures, patterns, and layering. In Fall 2011, she debuted her new ready-to-wear and accessories collections at Bergdorf Goodman, Nieman Marcus, Net-A-Porter, and her flagship boutique in LA. She also designs home furnishings for her Bergdorf Goodman boutique and rugs for the Rug Company. Wearstler was named "one of the best-dressed of the year" by Vogue, honored as one of the "elite design 100" by TIME Style & Design, and served as a judge on Bravo's "Top Design" series. She lives in Beverly Hills with her husband, hotelier Brad Korzen, and their two sons. 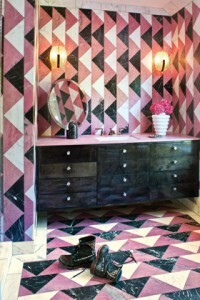 Kelly Wearstler: Rhapsody is her fourth book, profiling some of her most recent design projects. It was published by Rizzoli New York in October 2012.